Quality meat is our passion. We focus our attention on sourcing the finest whole carcus meat from a range of high class Yorkshire abattoirs. All our beef is born raised and slaughtered in Yorkshire. We mature the majority of our beef for at least 4 weeks and spend a lot of time ensuring our Pork and Lamb is butchered to provide the best eating joints possible. For over 30 years, we have developed a reputation for our excellent home cured bacons and sausages which we consider to make to our own family recipe. For over 25 years we have perfected and produced a range of pies, pasties and pastries. Sticking to the same family recipes, we continue to bake high quality pies with top quality fillings. All pies and pastries are made from scratch on the premises and baked daily. Using high quality ingredients we bake a wide selection of fresh bread and cakes daily. Our bread cakes make the perfect partner for our wide range of cooked meats to produce a selection of mouth-watering sandwiches. 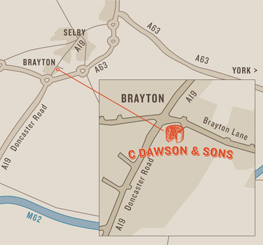 C Dawson & Sons was set up in Brayton in 1960 by our Grandfather Clifford Dawson and traded as a high class butcher with its own abattoir. The original shop was demolished in the early 80's to make way for a housing development and the business moved to its current premises in the converted manor farm. Following the retirement of Grandfather, second generation, Bill and Charles Dawson built the business into its current form, extending the high class butchers to include a bakery for bread and pies. With the looming retirement of Bill and Charles, a third generation of Dawson's Phill and John have taken over the business to maintain is reputation for high quality produce. We have been buying our meat, bread, pies and confectionary from Dawson's for 20 years now. The quality is consistently excellent. The service aways friendly, with helpful advice. We would not dream of shopping anywhere else. Address: The Green Brayton, Selby, North Yorkshire, YO8 9DZ. © 2013 C Dawsons & Sons LTD. All Rights reserved. Site by Visual Rockstars.